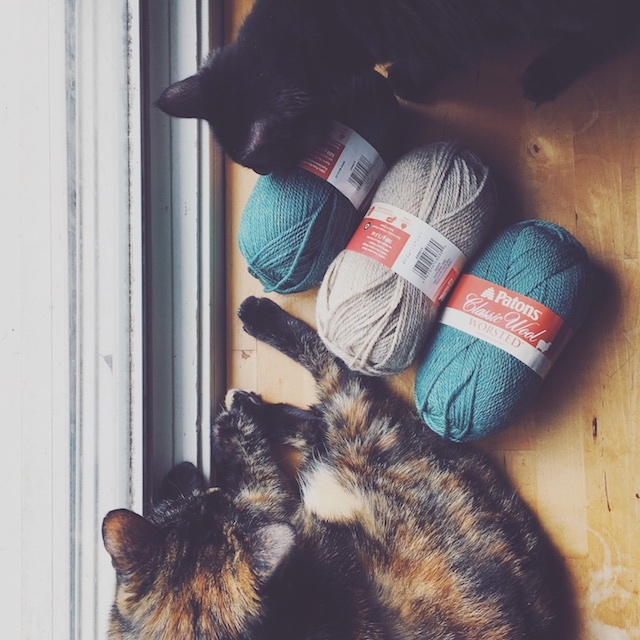 At the moment I'm involved in 4 knit-alongs. It's a bit much, I know. But it's hard to watch knitting friends "get together" to make something you have yarn for and not be a part of it. So I've started all 4 and I'll just see how quickly things get done. 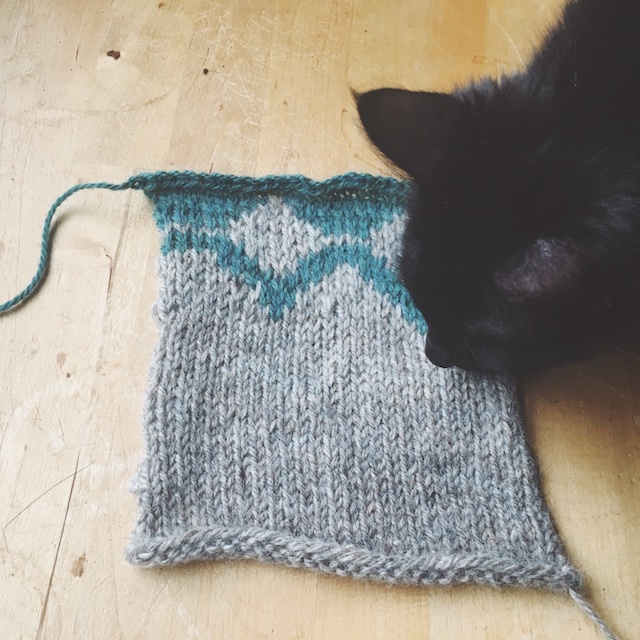 You've seen my progress on True Friend for the Kill to Craft Sweater-along already. I haven't knitted any more on that to focus on today's knit, which is also for the KTCSweateralong. It's Cherry Pie for the Great Northern Knit-along, in anticipation of the book release. This is that Twin Peaks- themed knitting book that I've mentioned before. I love the idea of a fitted, zip-front, Fair Isle cardigan. I'm only nervous about two things- getting my size right and installing a zipper, but I won't think about that now because I'm having enough trouble with the ribbing. Yeah, I'd just finished 4 inches of twist rib when I realized, like a doofus, that I wasn't knitting the ribbing correctly for working flat. I don't know if you can tell in this photo. Who am I kidding, everyone can tell from this photo. Even the non-knitters who see it throw their heads back in laughter. Everyone can tell... except me. This should be a no-brainer, but there you have the truth about me: I never sweat the small stuff; therefore, I usually screw up the small stuff. There was some ripping and re-knitting of 4 more inches of twisted rib, and I'm happy to say I am past the ribbing and on to the stockinette body. Ah, that moment when twist rib turns to stockinette! Whew, the rest of the body up to the yoke should be a snap. Or so one might think. 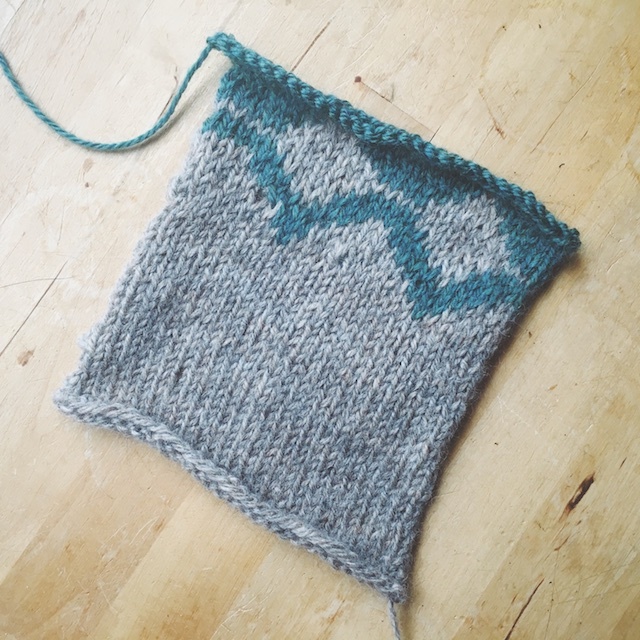 I'm not sure if I've posted my colors for this sweater on the blog yet. It's good old Patons Classic Wool in Natural Mix and Jade Heather. Jade Heather is my favorite Patons color. I once had a little stockpile of it, to make myself a simple pullover, but I decided to knit my husband a big, comfy sweater instead. So this is my chance to finally wear it. And then we'll be that syrupy twinsie couple. 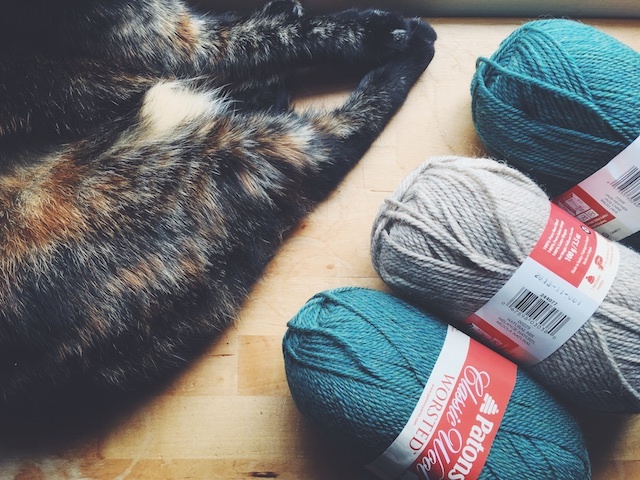 I know I've started buying some yarns from indie dyers, and such, but that doesn't mean I don't like Patons Classic anymore. It's one of the first yarns I ever used because I could buy it at a local hobby store and it was affordable. 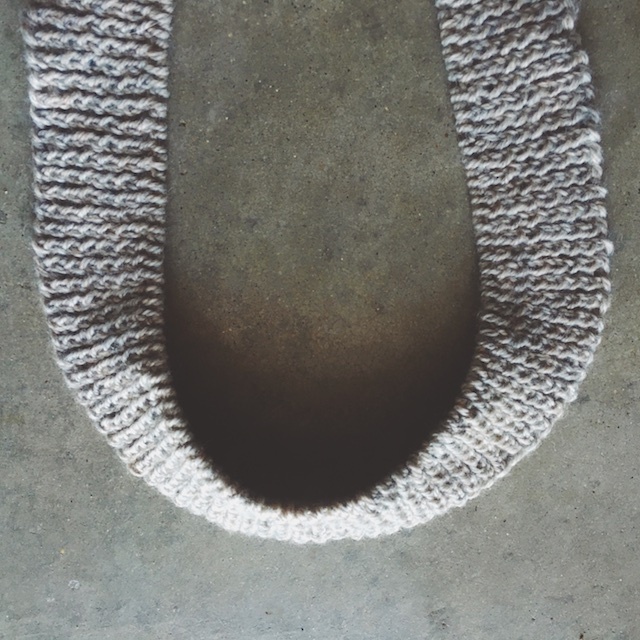 Everything I've ever knit in it is still kicking, or else I've outgrown it. 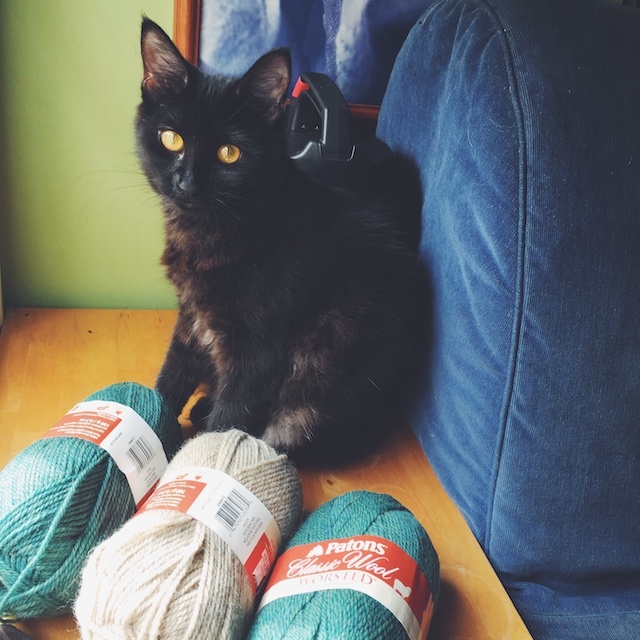 It's been knit up into some of my most favorite knits, like Beatnik. 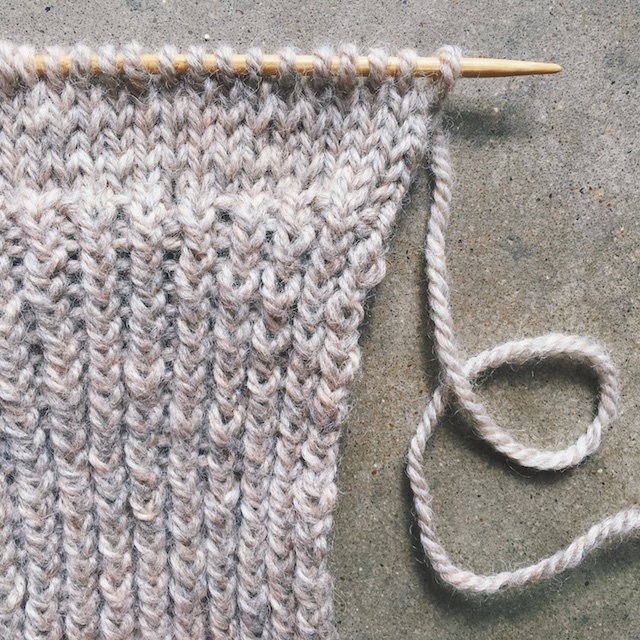 So, I feel nostalgic every time I knit with it, even though I still use it regularly. I also feel like I get more predictable results with it than with superwash wool. So, this little cardigan seems to have a bright future before it. and this little one will pick at it with her claws to show hers.